Hi there! Happy Monday! I thought I'd spice up this week with a giveaway! I was very lucky to receive a copy of the new Fat Quarter Style by the Fat Quarter Shop! What a great new book. There's plenty of inspiration in these pages, 12 great quilts from baby to queen size to make. The Fat Quarter Shop very generously sent along an extra copy for me to give away on my blog, so if you'd like a chance to win, leave a comment! I'll be home soon and then I will pick a winner. While you wait, head on over to the Jolly Jabber and look at all the pretty quilts in this book. Thank you for the chance to win a copy of Fat Quarter Style! I've been looking at this book and there are several patterns I'd love to use! Would love to win this fun book! Thanks for the chance. Great book! Thanks for a chance to win! Looks like a fun book! Thanks for the chance! Thanks for the opportunity to win this great book! Looks like it has lots of inspiration! 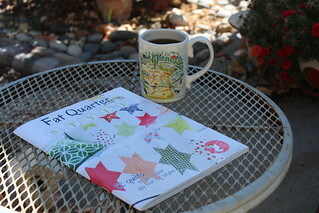 I visited the Fat Quarter Shop and really like all the quilts in this book. Looks like there's lots of different and fun quilts. Thanks for the chance to win. I would love to have this book! Thanks so much for the giveaway! Lots of inspiration. Thanks for the chance. What a fun bunch of quilts. The Primrose would look so fun in Pam Kitty fabrics. Hope I win. With the first preview - I had just 1 quilt in mind that I would like to make from this book. Now - after seeing all the beautiful creations from different bloggers - I feel this book would be a real treasure to have in my 'most favorite' quilt book section. Thank you for another giveaway chance! Ooooh! What a beautiful book!! Thank you for the very generous giveaway. I'm sure I could find something to make! Thanks for the opportunity. Thanks for the great giveaway--I would luv to receive a copy of the book--it looks awesome. Great giveaway and great book! Fat Quarter Style looks like a winner with lovely and do-able quilts in 4 sizes. Thanks for the chance to win! Thanks for the chance to win a copy of this book. I hope you're enjoying your time in Minnesota. This looks like such a fun book, I just love quilts made with white fabric to set off the other fabrics. Thank you for the chance to win a copy of this fun book. I would love love love one of these books! Thank you! Holla!!! Love the book! Thanks for the giveaway. Just found your blog recently and am loving it. Love fat quarters, they just seem to be the answer to not having a stash you can't find anything in. Thanks for the fun. Laura V.
They publish the best quilting books!! OOhh...I would love a new book to start something with my fat quarter stash. Thanks! Looks like a great book. Enjoy your vacay! Would love to try out these new patterns. Would so love to win this book. Am wanting to win something someday!! Torn between "nice giveaway" and "evil temptation to start a new project". Thanks for hosting a giveaway! Cheery wave! I've been seeing this book around blogland and it looks wonderful. Thanks for the chance! Love to have the book!!!! Just starting to quilt!!!!! I've loved seeing these patterns pop up around the place and I'd love to own a copy of the book too! Thanks for the chance! Looks a great book - I love Raindrops!! OOOH! Lovely book, lots of fun patterns to try! I could take this off my wish list if I won!! Thanks for a chance to win this pretty book. Enjoy the rest of your visit. Thanks for the chance to win Fat Quarter Shop's new book. We all love to buy fat quarters. Have a good time in Minnesota. I will be heading to Rochester, for a wedding on September 13th. Hopefully I will have a chance to look for quilt shops. Fun giveaway - thank you! Great giveaway! Wish me luck! I would love to win this book! Thanks for the chance!! Beautiful book, great inspiration. Thank you for the chance to win. Thank you for the give away. I'd love to win this. Thanks for all the inspiration on your blog. There are so many lovely quilts in this book! thank you! Oh I would love to have this new book!! Thank you for your great blog. Thank you for the chance of a wonderful book. Sign me up. I visit them daily. Glad you are having a good time in Minnesota. Thanks for a chance to win the Fat Quarter Style book. Looks like a lovely book! Thanks for a chance to win! This book is definitely on my 'need to buy' list! Your blog is a daily must for me to check! Love your ideas! Count me in on the drawing! Love your blog! So glad you post so often! Would love to win the book! Thanks for the opportunity to win this jFat Quarter Style book! I love making projects using Pam Kitty Fabrics! love the quilt on the cover. Thanks for the chance to win a beautiful quilt book! Looks yummy! Have seen some good peeks into this book. It looks terrific. Thanks for the chance to win! Well I will be the lucky one if I win this! Fat Quarter Shop is so awesome and thanks for the giveaway! I like the looks of Minnesota! Nice you have a sweet home to visit there!! I'd love to win! Yhanks for the opportunity. Sorry I missed you at the fair, but would love to have a copy if this book! Would just LOVE to win a copy of the Fat Quarter Style book. I enjoyed the first book and made a few quilts which were very easy. Safe travels! Would just to win this wonderful book! Thanks so much for the chance to win. Glad you have enjoyed your time in Minnesota! I live just south of Minneapolis/St Paul and love it here:) Thanks for the chance to win this book! I'm not sure if I'm too late to enter, I'm way behind on my blog reading! Glad you enjoyed your trip to my home state of Minnesota. Love your fabrics! Thanks for the giveaway!